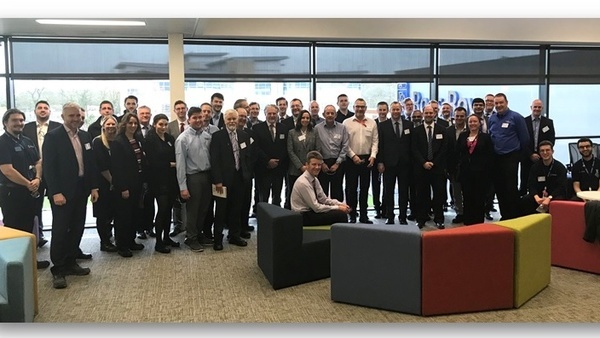 Rolls-Royce Control Systems hosted this Midlands Aerospace Alliance (MAA) event at the Derwent Building. Forty visitors from a broad spectrum of aerospace companies saw presentations on RRCS products, strategic direction and supply chain methods. This was followed by site tours of electronic and hydromechanical manufacturing and engineering test facilities. The event was sponsored by MAA Director Robin Hill, Head of Electronics at Rolls-Royce, as the latest in the series "Inside . . . with the MAA" which started in 2011. The openness of Rolls-Royce was really appreciated the opportunity to meet people at RR that I would struggle to get access to was great. Great event, invaluable for updated information both market and company wise. The tours were excellent and members of staff seemed enthusiastic and proud of the company and their work. In discussion, it was recognised that innovative potential suppliers – and even current suppliers -- can find large aerospace companies like Rolls-Royce difficult to penetrate or persuade of the mutual benefits of new ideas and improvements, and that the whole ecosystem can suffer as a result.